Finches make things interesting. While warblers and sparrows and thrushes travel the continent in predictable ways, summering and wintering in foreseeable places, finches wander chaotically, searching for seeds. And not just seeds. Eastern forests are known for their prolific mast production. Mast is the botanical name for all the nuts, seeds, buds, and fruits produced by trees and shrubs. This production varies widely from year to year. Many trees follow a cycle, producing more growth in some years, more seeds in others. These latter years are called high-mast years, and it may be the tree’s way of producing more seeds than wildlife can possibly eat, therefore assuring that some seeds will germinate and produce the next generation of trees. In seasons of high stress, such as droughts, some trees automatically produce more seeds, attempting to assure survival of their species. Thus, the amount of natural food in a particular patch of forest changes from year to year. Many bird species, especially finches, wander in search of the best food plots. These birds would prefer not to travel long distances in search of food. They’d be perfectly happy to stay in the northern forest if they could. But in some years, they have little choice but to head south — sometimes far south. These southward wanderings are called irruptions. Given the variations in food abundance throughout the north woods, you might think irruptions are unpredictable. Think again. Ron Pittaway is an ornithologist in Toronto. Every year, he and his colleagues assess the food abundance in the Canadian forest and make a forecast of what the finches will do. It’s a highly-anticipated bellwether of what birders can expect during the upcoming winter. Although Pittaway’s forecast came out in mid-September, I have waited until now to mention it. We’ve entered an age where wild claims run amok, so I like to do a little fact-checking before I pass on factoids. I am now seeing signs that Pittaway’s finch forecast was accurate. American goldfinches are at my thistle feeders. Pine siskins are eating the catkins from bushes in the backyard. Reports of evening grosbeak sightings are coming from all over the state. Even a few common redpolls have been reported, which is unusual this early in winter. Pittaway and his merry band of biologists note that it’s a poor year for cones and birch seeds throughout Ontario and The Maritimes, although there is a good spruce cone crop in Newfoundland. Accordingly, they advise birders to stock up on black oil sunflower seeds for the winter, because it could be a busy year. Specifically, the forecast calls for purple finches to abandon Canada this winter and head south, perhaps as far as Virginia. Pine siskins started heading south in early autumn, although some may have gone west, since cone crops from Minnesota to British Columbia are doing well. Of particular note, common redpolls are expected to irrupt into New England this winter. It’s been a while since we’ve had a good invasion of redpolls. When they do come in, be prepared for big flocks. It’s not unusual to have 100 birds mobbing the thistle feeders at once. Be on the lookout for hoary redpolls. This species is a frostier version of the common redpoll. It stands out from the flock due to its whiter color and finer breast streaks. They’re rare, but a few will inevitably lurk within the larger flocks of common redpolls. Pittaway predicted that evening grosbeaks would be discouraged by food shortages in Canada, and head south. That forecast is already proving to be true. Crossbills were expected to be fewer in New England this year, and I can attest that this prediction was accurate long before it was made. 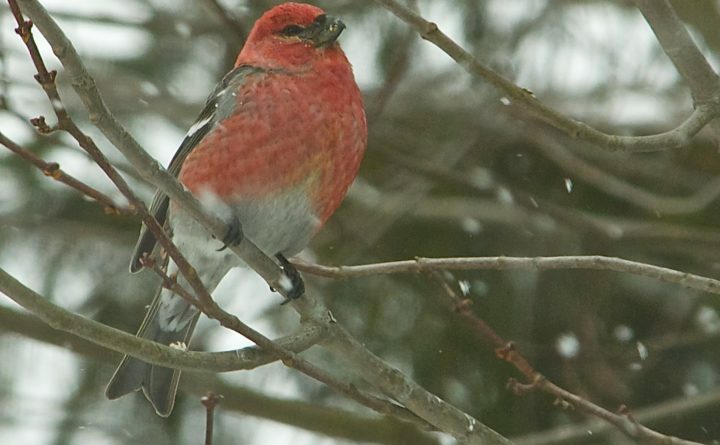 Last winter, the north Maine woods were full of crossbills. But they all departed by summer, apparently bound for Newfoundland and the west, where cone crops are prolific this year. Fruit-eaters will likely visit us in greater numbers this year. The Canadian forest has produced a below-average crop of mountain ash berries and crabapples. That’s a sign that we may see more pine grosbeaks and bohemian waxwings this winter. Last year, very few visited Maine. Even some of the more common birds are moving south from Canada. Red-breasted nuthatches and blue jays are abandoning the Canadian forest, due to a lack of acorns, beechnuts and conifer seeds. Maine’s own red-breasted nuthatches are showing signs of moving south. Clean the feeders. Stock up on seed. It looks like an exciting winter ahead.